Data is the key to refining any marketing channel. Referral is no different. Stats for which advocates refer the most, how long it takes them to do it, and what other kinds of interactions they have with your brand tell you how to tweak your program and get more people moving through the referral funnel. But that’s just scratching the surface. You can do much more with that data than just build a better referral program. The advocates touting your products to their friends and driving your referral program are your brand’s most dedicated fans. The data you get on who these people are, what they have in common, and what drives them to refer can lift all of your customer acquisition efforts. Here are eight of the savviest ways you can put different kinds of referral marketing data to work. Nothing does more for your brand than a core of enthusiastic, passionate customers evangelizing your product. Your top advocates are exactly those kinds of customers. By segmenting advocates based on how often they refer, you can easily uncover the shared characteristics of your most loyal customers so that you can target them in the future. Referral is so powerful because today’s customers trust recommendations from people they can relate to over conventional advertising. Another powerful method that also relies on regular people to deliver the authenticity customers crave is influencer marketing. With their wide reach and demonstrated ability to get people using your products, your top advocates are poised to become your brand’s influencers. Reach out and ask them to promote your brand outside the referral context, such as by writing a guest blog post about how they use your product. You probably have an ideal customer profile (ICP) based on who you envision as getting a ton of value from your product. But that’s just hypothetical. With referral, you see exactly what your advocates—the customers who love your product enough to refer—look like. You can use that data to better root your ICP in reality. Look for what top advocates have in common—whether it’s age, gender, location, occupation, whatever—and incorporate them into your ideal customer profile. Customers need to be certain your product is great before they put their personal stamp of approval on it, so they typically won’t start referring as soon as they buy from you. It usually takes a few different purchases, time to explore the different applications of your product, and outreach from your end. By comparing the differences in those interactions for customers who refer versus those who don’t, you can spot the differences in customer experience that correlate with higher engagement, and adjust accordingly. Analyze how customers use your product before referring. For a retailer, this means looking at advocates’ purchase histories. If a disproportionate number of advocates all bought the same jacket from you before they referred, that suggests it gets people more excited than your other items. You should display the jackets more in your store’s ads. If you’re an app maker, you can use a service like Amplitude to measure which features advocates use most before they refer. They’re what matter to your most enthusiastic customers, so you should push them in your marketing efforts. Between email, social media, and push notifications, there are plenty of different ways to reach your current customers and keep them engaged. Your referral program can be a testing ground to find the best ones. 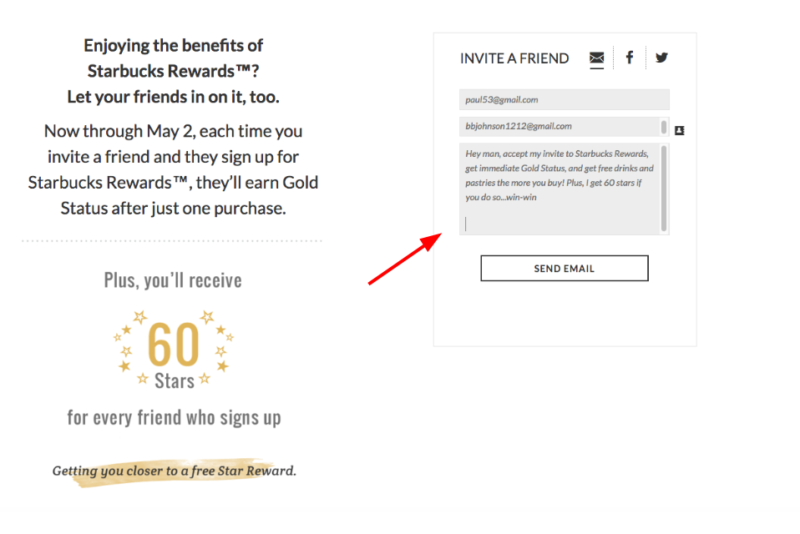 If you’ve found that emails are best for getting customers excited enough to refer, they’re probably the right medium for other kinds of lifecycle marketing. Each is just another form of creating higher engagement with current customers. 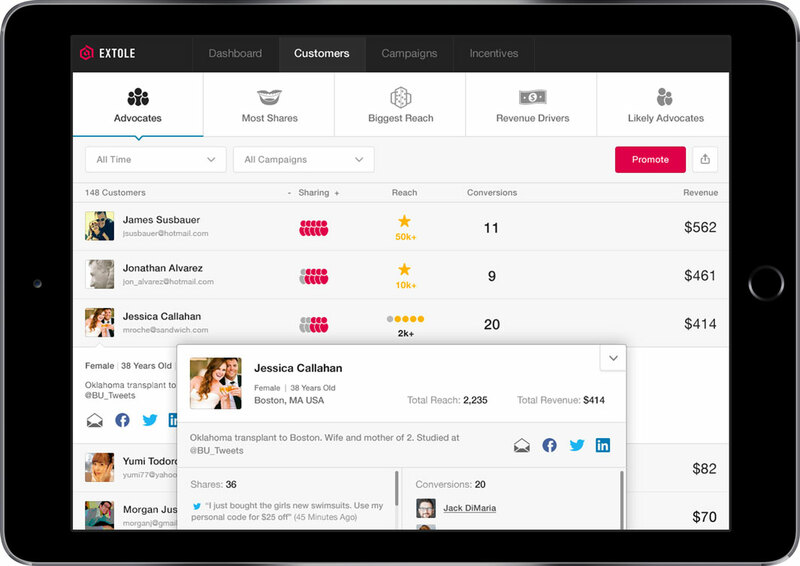 Referral marketing platforms like Extole can pull social media data for all of your advocates. That gives you granular insights on just who these awesome customers are, what they’re most interested in, and where they like to hang out online, so that you can shape your marketing efforts accordingly. When it comes to social media marketing, you need to meet your future customers where they already are. Your referral program can tell you which social media platform that is for the most engaged customers you’ve got—your advocates. If you find that they like to spend most of their time on Twitter, then focusing your social media efforts there is likely to turn up more future advocates. Social media data will also tell you what your advocates are interested in besides your product. Just take a look at what they share on Facebook, retweet on Twitter, and double tap on Instagram. That information can shape the content of your own marketing messages, show you potential companies to consider partnering with, or even give you ideas for future, complimentary products to roll out. Marketers know they need to cultivate an image that resonates with their target customers, but the qualitative nature of branding makes it hard to nail down. Your referral program gives you a unique chance to address that challenge by reading the messages advocates send to their friends when they share a referral. It gives you an inside look at how your best customers describe your product when they’re persuading their friends to give it a try. If you see advocates consistently saying the same things when they refer your product, you should incorporate those ideas into your own marketing efforts. For instance, gift card marketplace Cardpool saw that lots of its advocates were pitching its product as a great option for “date night.” That wasn’t a use case they’d considered. Thanks to referral, Cardpool now had a new angle for how to position its product. The referral message is where advocates draw on their own experiences and tell their friends what makes your product so valuable. That also makes these messages the perfect fodder for testimonials. You can either lift quotes directly from the messages and put them on your site, or even reach out to advocates who write particularly interesting messages and ask them to help you craft a more substantial case study. Your referral program doesn’t just exist in a vacuum. It’s a key part of your larger marketing ecosystem. And thanks to the one-of-a-kind data it generates, referral marketing gives you unique opportunities to lift every other channel. By looking at your advocates and applying lessons from the tactics that get them to refer, you can ensure that all your marketing efforts target customers who are just as engaged as they are.